Foot fractures can happen for a variety of reasons. In athletes, these bone fractures typically occur from a sudden trauma or as the result of untreated bone stress reactions. Whatever the cause, bone fractures in the feet are serious injuries that usually require a lot of down time for healing. Here, we’ll cover the different types of bone fractures and how to prevent them. Although many people think of bone as an inanimate thing, bones are actually made up of living tissue that is constantly undergoing changes. Bone can grow stronger when stress is placed upon it, but only if done in the right way. Whenever we stress our bones through repeated physical activity, exercise or sports, the bones initially become weaker. However, this initial weakening triggers the bone to grow a thicker outer layer. The additional growth that occurs makes the bone stronger over time. Foot fractures can occur when an individual continues to place more and more stress on the bone without giving it enough time in between to rest. As a result of the repeated stress placed on it, the bone can eventually succumb and break. A full foot fracture is a break in one or more bones of the foot and is the result of a traumatic injury to the area. A motor vehicle crash or dropping a heavy object on the foot are common causes of these severe fractures. Stress fractures also involve one or more broken bones but are the result of repeated overuse and stress to the bone(s) rather than one specific incident. This type of fracture is common among athletes who often mistake the pain for a less serious injury and don’t take appropriate precautions. Stress fracture symptoms include swelling and pain that increase over time if not treated. While foot stress fractures may sound less severe than breaks resulting from trauma, they still involve a broken bone and may require surgical treatment. Calling a foot fracture simple doesn't necessarily mean that it's not a severe break. A simple fracture simply refers to one that occurs without breaking the skin overlying or tissue surrounding the bone. In this type of full fracture, only the bone is damaged. Simple fractures most often result from repetitive use rather than traumatic injuries. Compound fractures are the other type of full fracture that involves a broken bone in addition to damage to the surrounding tissues or overlying skin. These are usually more serious simply because the break is often worse given that it has caused additional injury other than just the bone. Since the skin itself is also no longer intact, infections can also be another potential complication with this type of fracture. 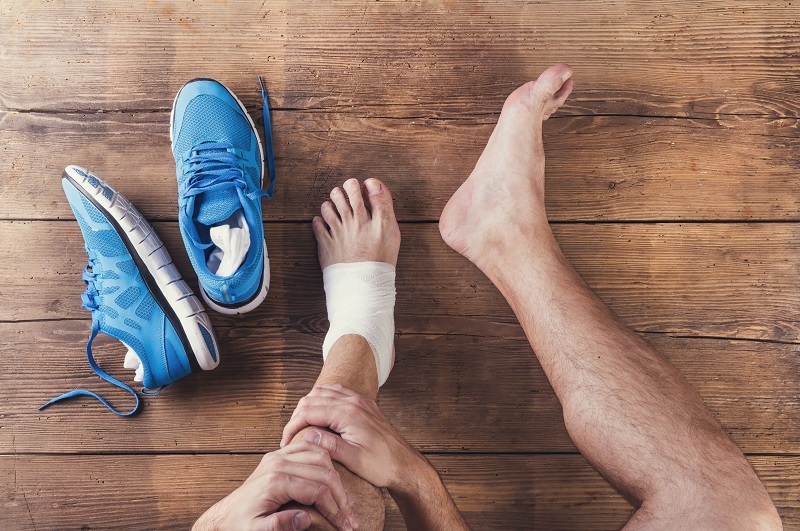 While the traumatic injuries that cause full foot fractures can't always be prevented, it’s important to practice caution when possible and stay aware of your surroundings. Alternatively, stress fractures usually come with warning signs that allow an individual to correct the underlying problem before the bone actually suffers a fracture. In athletes, for example, repeated overuse of the bone without giving it enough rest can result in pain that gradually worsens. If this pain is ignored, the bone can continue to weaken; if the pain is ignored long enough, an actual stress fracture may occur and require months of rest in order to heal. To avoid stress fractures, we advise you to pay attention to the signs your body is giving you. If pain persists during workouts or continues to get worse over time, take a step back and allow the area to heal before continuing with placing additional stress on the bone. A few days’ rest is usually far better than spending months with your feet up. If you do find yourself with a fractured foot, there are a wide range of foot and ankle braces available to facilitate the healing process. During the healing period of foot fractures, it’s important to keep pressure off the affected area, meaning you’ll be seriously restricted in your mobility. Be aware of this common injury so you don’t have to put your life on hold! Listen to your body and take proper precautions to avoid getting hurt. If you’ve experienced a foot fracture and have any tips to share, feel free to comment below!